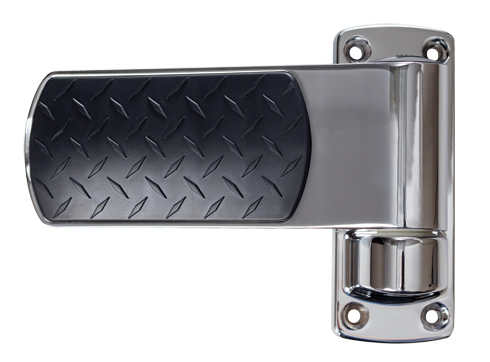 Precision die-cast zinc flange with nylon cam, die-cast zinc strap, and elastomer insert cover. Polished chrome and brushed chrome with black accents. Custom colors and/or patterns available based on volume commitment. Each strap adjusts ±1/8" to provide 1/4"+ height adjustment. To adjust loosen main clamping bolts, jack door using micro adjustment screw, and tighten clamping bolts. Drilled for 1/4" (6mm) screws.